The owners of small apartments know firsthand about all the difficulties of the optimum organization of the living space. 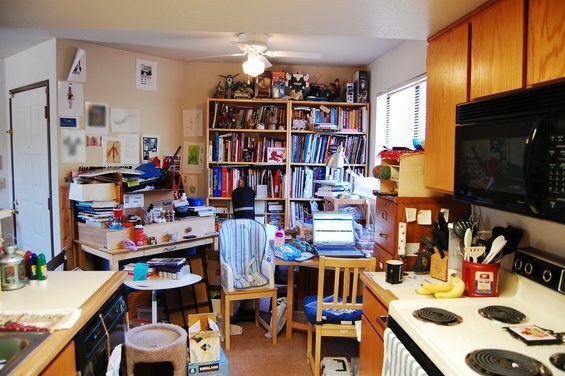 The separate headache of the owners of such apartments is the placement of all those things which are so difficult to do man: clothes, shoes, books, appliances, cosmetics and many important and useful things. Ten ideas for effective storage of household furnishings and utensils will help to make a small apartment functional and comfortable. 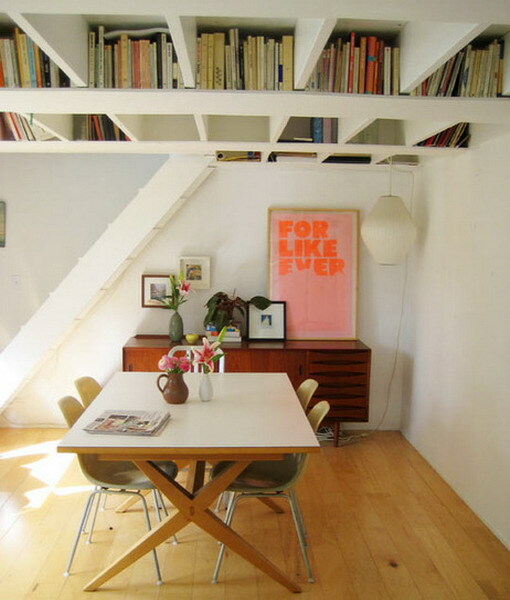 The interior of a small apartment does not allow the congestion of the furniture – massive racks, bulky dressers, large tables are convenient for using and storing different necessary things in the economy, but at the same time they visually and physically "eat" the space and hard to allow you to create a stylish interior. The use of horizontal surfaces is not limited to tables and table tops coffee, coffee and dining tables. Interior designers, working tirelessly on the creation of stylish decorations small spaces, I suggest not to ignore the... ceiling. 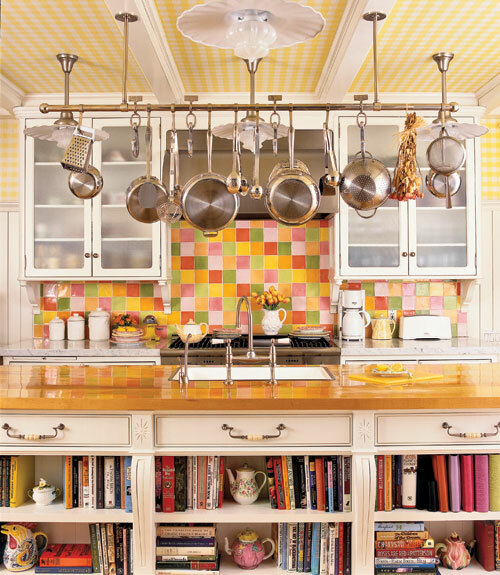 Designating part of the ceiling to create small compartments-shelves, you can create eye catching and comfortable area for storing things that are rarely used. For those who are not afraid of bold experiments, we propose an original and bold design of the ceiling bright baskets, placed on a roller mechanism similar to that used in the bathrooms for drying clothes. Basket, selected by the color scheme of the design space, create a unique flavor and will add a stylish note to the interior. Additional storage space for Cutlery and various kitchen things can be organized by small alterations of the dining table in the same embodiment, but with a flip-up top. 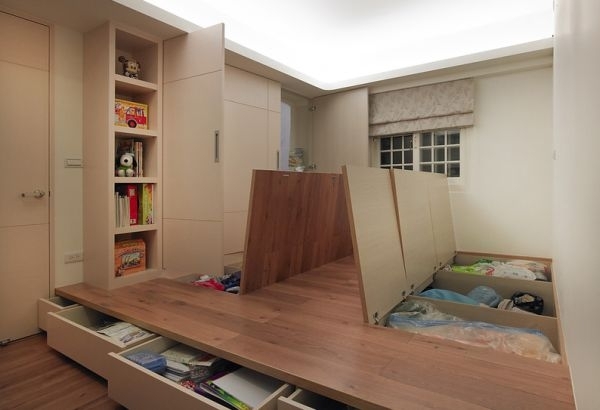 The space underneath is usually enough to accommodate a large box, and lifted the top, equipped with special pockets with buttoned flaps, will help to increase the usable area of the drawer. Classic kitchen stools ought to be replaced by Ottomans, reclining cover which can be placed inside this piece of furniture many useful and useless things. The same applies to sofas, beds, foot stools – equipment these items roomy drawers will help to efficiently accommodate the huge number of things. To optimize space without compromising design small apartment will help in the first place, racks located in them with beautiful containers to store things. Such containers not only decorate the interior, but also will contribute to the maintenance of order in the house. In addition, such containers can be placed under beds, cabinets and tables, which significantly contributes to space optimization. If the apartment has a window between the kitchen and the bathroom, you can use this doorway for arranging small Cabinet, allowing you to store rarely used items – the inventory of household chemicals, personal hygiene products, etc. Seasonal storage of warm blankets, coats, jackets, typically occupying much space, you can turn to his advantage, made them beautiful textile zipper pouches and making these soft overall items in a convenient pillow. Voluminous blankets that are installed on a solid base, make them comfortable armchairs that can be placed on balconies and loggias. Brilliant idea, borrowed from the rational of the Japanese, based on podiums with internal compartments – this allows not only to zone the space of the apartment, but also contributes to the placement of a huge number of things. Pockets-organizer and cute wall bags, located on the walls, effectively help save storage space and to accommodate the huge number of things normally used in bathrooms and hallways. For small kitchens salvation are magnetic boards, all kinds of hooks and suspension systems. The same purpose serve and the equipment of the sill top and small drawers.